What's new in Spyware Terminator 2.5.6.316? Windows 7 Beta Support - Spyware Terminator is now compatible with the Microsoft's newest operating system, Windows 7.
Review List Improvement - We've added a new button that lets you delete all items from the Review List at once. 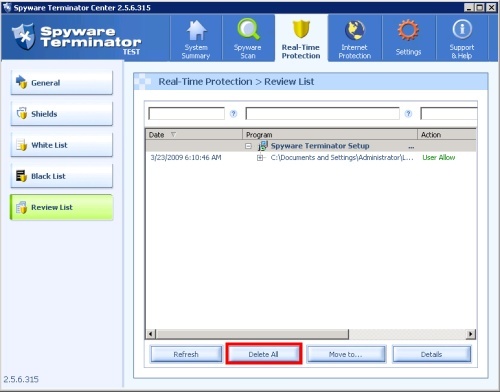 Installation Wizard Extension - Now you can set up Real-Time Protection and HIPS within the Spyware Terminator installation wizard. Scheduled Scan - Scheduled scan is automatically set to the hour of Spyware Terminator's installation unless you pick another time. This adjustment will prevent overload of our servers and ensure a smooth update before the scan. Spyware Terminator Service is now even more stable and reliable. Multilanguage Support - Spyware Terminator 2.5.6.316 is available in English, Spanish, German, French, Italian, Brazilian Portuguese, Hungarian, Czech, Dutch, Russian, Serbian, Romanian, Catalan and Valencian. Get the latest version of Spyware Terminator! Do you want to protect your computer from spyware and other malware with the latest version of Spyware Terminator? Download the latest version now!